Jorge Pla-Garcia is a Ph.D. student from University Complutense (Madrid, Spain) focusing on Mars Atmosphere modeling. His advisor is Dr. Scot C.R. Rafkin (SwRI). Jorge holds a B.S. in Computer Science (University of Salamanca, Spain), a M.S. in Space Science (University of Alcala, Spain), a M.S. in Astrophysics (International Valencian University, Spain) and a M.S. in Meteorology (University Complutense, Spain).He has ten years of experience in Space Science. 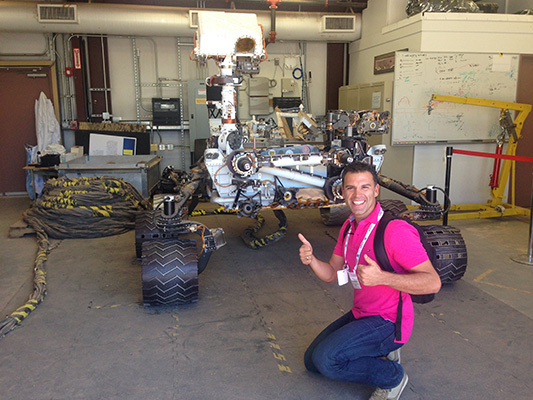 Jorge is a Research Scientist in four NASA Mars Projects related with Mars atmosphere science: REMS instrument (NASA MSL Curiosity rover mission), TWINS instrument (NASA InSight mission) and MEDA instrument & EDL Council of Atmospheres (both in NASA Mars2020 mission). He also worked for three years in the ExoMars2018 mission (RLS instrument, ESA). He is affiliated at the Madrid Center for Astrobiology (associated to NASA Astrobiology Institute) from 2009-today. Jorge is working on the meteorological interpretations of Mars sites, performing meteorological predictions for Mars2020 high-priority EDL landing sites and constraining the source of Curiosity rover methane detections using mesoscale modeling. He presented his work giving lectures in the five most important planetary science congresses in the world: AGU (San Francisco), EGU (Vienna), JpGU (Tokyo), EPSC (Nantes and Riga) and DPS (Pasadena and Provo). He is leading a new outreach project: a monthly Gale crater weather report. The idea is to publish the first time ever Gale crater weather report every Martian month (2 Earth months) for the general public in language referencing meteorological phenomenon similar to Earth. In 2016, Jorge received the Japan Geoscience Union (JpGU) Student Outstanding Presentation Award. In 2013, Jorge received the NASA Group Achievement Award as part of the REMS Team. During the fall of 2016 Jorge was onsite in Space Science Institute Boulder offices and during 2013 Jorge at the Southwest Research Institute (SwRI), also in Boulder (CO). He is falling in love with the Boulder area. He loves to ski and bike the Rocky Mountains! He worked also at the Teide Observatory (Canary Island) from 2007-2009 as telescope operator/astrophysicist. He loves educational outreach for kids and he collaborates in dozens of programs for schools. He is part of a french outreach project than aims to introduce Mars weather into the high schools of France. Jorge used to say that when he was a kid, science fiction gave him a sense of wonder and now he feels the same just going to work every day. His passion for space comes from Cosmos TV series, his father (Jose Antonio) used to play it at home. Jorge now feels very proud to be part of the One Earth Message (OEM) Project with Jon Lomberg (chief artist of Cosmos TV series) as Director. Jorge is executive secretary of NGO "Africa Sawabona" and director of Sanitary Mission to Senegal during last July 2015. He was a professional water polo player from 1996-2008.